When a third doped element is added to a crystal diode in such a way that two P N junction are formed, the resulting device is known as a transistor. The transistor is capable of achieving amplification of weak signals. Transistors are far smaler than vacuum tubes, have no filament and hence do not need power to heat the filament. They are mechanically strong, have practically more life and can do some jobs better than vacuum tubes. An N-P-N transistor is composed of two N-type semiconductors separated by a thin section of P-type as shown. However, a P-N-P transistor is formed by two P-sections separated by a thin section of N-type semiconductor. In each type of transistor, the following points may be noted. There are two P N junctions. Therefore, a transistor may be regarded as a combination of two diodes connected back to back. There are three terminals, one each taken from each type of semiconductor. The middle section is a very thin layer. This layer is very important. Naming the transistor terminal: A transistor (P-N-P or N-P-N) has three sections of doped semiconductors. The section on one side is the emitter and the section on the opposite side is the collector. The middle section is called the base and forms two junctions between the emitter and collector. (i) Emitter: The section on one side that supplies charge carries (electrons and holes) is called the emitter. The emitter is always forward biased with respect to the base so that it can supply large number of majority carriers. In fig. (a) the emitter (P-type) of PNP transistor is forward biased and supplies hole charges to its junction with the base. Sirnilarly in fig. (b), the emitter (N-type) of NPN transistor has forward bias and supplies free electrons to its junction with the base. (ii) Collector: The section on the other side that collects the charges is called the collector. The collector is always reverse biased. Its function is to remove charges from collector-base junction. In fig. 10.8 the collector (P-type) of PNP transistor has reverse bias and receives hole charges that flow in the output circuit. Similarly in fig 10.9 the collector (N-type) of NPN transistor has reverse bias and receives electrons. (iii) Base: The middle section which forms two PN junctions between emitter and eolleetor is called base. The base emitter junction is forward biased, allowing low resistanee for the emitter circuit. The base collector junction is reverse biased and provides high resistance in the collector circuit. A transistor raises the strength of a weak signal and thus acts as an amplifier. The weak sigrıal is applied between emitter-base junction and output is taken across the load R C eonneeted in the collector circuit. In order to achieve amplification, the input circuit should always remain forward biased. To do so, a D.C. voltage VEE is applied in the input cireuit at base in addition to the signal as shown. This D.C. voltage is known as bias voltage and its magnitude is such that it always keeps the input circuit forward biased, regardless of the polarity of the signal. As the input circuit has low resistance, therefore a smail change in signal voltage causes an appreciable change in emitter current. This causes al most the same change in collector current due to transistor action. The collector current flowing through a high load resistance R C produces a large voltage across it. Thus, a weak signal applied in the input circuit appears in the amplified form in the collector circuit. In this transistor acts as an amplifier. Transister is a current amplification device. Transistor Data Sheets: To analyze or design a transistor circuit one must have sufficient information about the transistor. This information is obtained from the manufacturer´s DATA SHEETS. The data sheets also give information on maximum power dissipation, max. allowable collector base voltage, current gain etc. 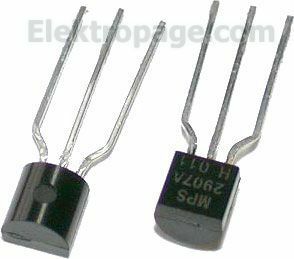 They also give the orientation of leads in a transistor. While substituting for transistors, following points are to be considered. The NPN transister replaces a NPN transistor. A Ge transistor replaces a Germanium (Ge) transistor. The most important characteristic is the transistor current gain which must be nearly same. The transistor casing and size should match in order to fit back into the circuit. If the ternperature of the collector base junction increase, the collector leakage current ICBO increase. Because of this, collector current increases. The increase in collector current produces an increase in the power dissipated at the collector junction. This in turn further increases the temperature of the junction and so gives further increase in collector current .The process is cumulative. It may lead to the eventual destruction of the transistor. This is described as the thermal runaway of the transistor. In practice, thermal runaway is prevented in a well-designed circuit by the use of stabilization circuitry. For transistors handling small signals, the power dissipated at the collector is small. Such transistors have little chances of thermal runaway. However in power transistors, the power dissipated at the collector junction is larger. This may cause the junction ternperature to rise to a dangerous level. We can increase the power handling capacity ol a transistor if we make a suitable provision for rapid conduction of heat away from the junction. This is achieved by using a sheet of metal called heat sink. Connecting a heat sink to a transistor increases the area from which heat is to be transferred to the atmosphere. Heat moves from the transistor to the heat sink by conduction and then it is removed from the sink to the ambient by convection and radiation.